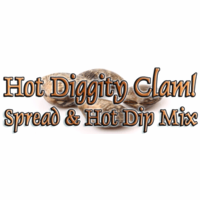 Hot Diggity Clam Dip & Spread Mix by All Mixed Up, Ltd. Description: Hot diggity damn this stuff is good!!! That's what you'll be exclaiming once you mix up a batch of our creamy, tangy clam dip. It'll be packed with clams, onions, peppers, Worcestershire sauce, lemon juice, and cayenne pepper for a little zip. Made just for seafood; serve it as a hot dip or a cool spread. Features: No added MSG. Made from scratch, in small batches, from our own original recipe in Ohio. Shelf Life: 3+ Years. Store for 5+ years out of sunlight, below 70 degrees Fahrenheit, in an airtight container. Abbreviated Ingredients: seafood dip base (onion, chicken soup base, tomato powder, seafood seasoning, red & green bell peppers, < 2% silicon dioxide), lemon juice powder, Worcestershire sauce powder, cayenne pepper. Contains wheat & soy. Packaged in a facility that packages wheat, milk, soy, egg, peanuts, and tree nuts.